Place melted butter in medium bowl; set aside. In large bowl, mix brown sugar, soy sauce, oil, chile garlic sauce and ginger. Stir 2 tablespoons of the brown sugar mixture into the butter; reserve. Add chicken broth and instant rice to brown sugar mixture in large bowl; stir and let stand about 8 minutes or until most of liquid is absorbed. Stir in bell pepper, carrots and green onion whites. Meanwhile, add chicken to reserved brown sugar-butter mixture; turn to coat. Place chicken breast on center of each sheet of foil. Spoon rice and vegetable mixture evenly around each chicken breast. Pour any remaining liquid over chicken breasts. Place packs on grill over medium heat. Cover grill; cook 10 minutes. Rotate packs 1/2 turn; cook 7 to 10 minutes longer or until juice of chicken is clear when center of thickest part is cut (at least 165°F). Remove packs from grill; cut large X across top of each pack. 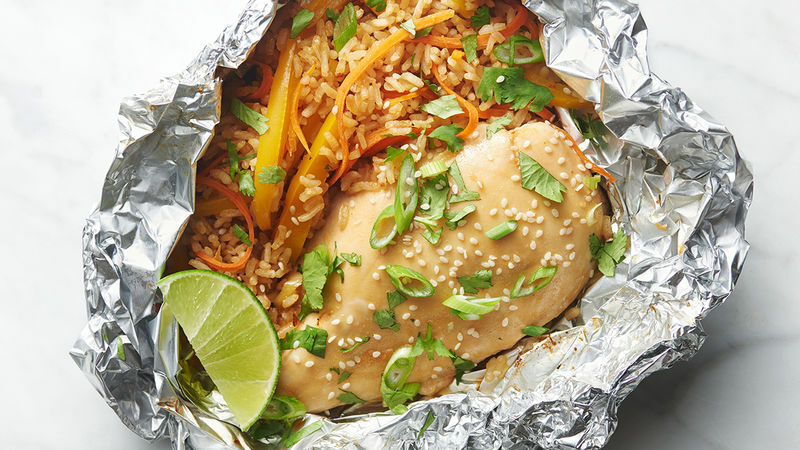 Carefully fold back foil; garnish with green onion greens, cilantro and sesame seed. Serve with lime wedges. To make in oven, place packs on cookie sheet. Bake at 375°F 30 to 35 minutes or until juice of chicken is clear when center of thickest part is cut (at least 165°F). Garnish and serve as directed above. Short on time? Opt for bagged preshredded carrots. Like it hot? Use 1 tablespoon chile garlic sauce instead of just 2 teaspoons.